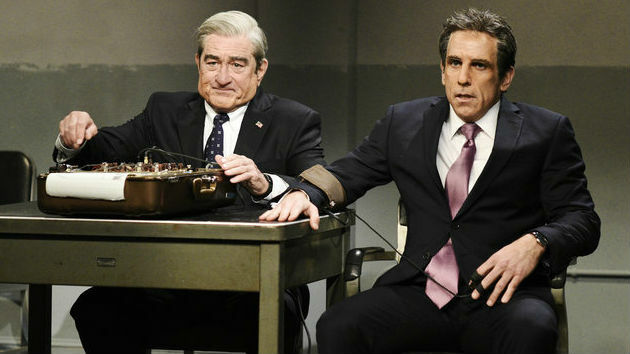 NBC/Will Heath(NEW YORK) — Hollywood A-listers Robert De Niro and Ben Stiller made cameos on the cold open of this weekend’s Saturday Night Live, spoofing one of their hits as they took on the chaos surrounding the Robert Mueller investigation. The episode opened with Kate McKinnon’s Jeff Sessions and Beck Bennett’s Mike Pence worrying about the raid on President Donald Trump’s lawyer Michael Cohen’s office. They welcomed Cohen, played by Stiller, to their office. “Michael Cohen, attorney at law — and also sometimes not at law,” he introduced himself. De Niro would then give Stiller’s Cohen a lie detector test, which he failed when asked if Trump knew about the payment of $130,000 to Stormy Daniels. The show even got a chance to make a callout to De Niro and Stiller’s famous “Can you milk me?” scene in the duo’s 2000 comedy Meet the Parents.